Jacob Stockdale insists he will continue to look to improve his game even after an impressive season in both green and white jerseys last season. The international winger - who set a new trying scoring record in the NatWest Six Nations Championship as Ireland claimed a rare Grand Slam - will make his first appearance of a new season tonight. 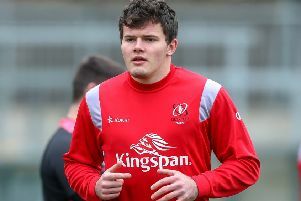 He has recovered from the hamstring injury he picked up during pre-season training to start against Connacht at Kingspan Stadium in the Guinness PRO14 on Friday night (7:35pm). The timing could just be perfect for the recharged Newtownstewart-born man with two European Champions Cup fixtures on the horizon with his Province and then the November Guinness Test series with Ireland in November. After the heroics of last season - which included being part of the successful Ireland side on the summer tour to Australia - Stockdale admits he is trying not to dwell on the past too much. “To be honest I’m trying not to think about it too much,” he said. “ Like last year, when I had set out my goals at the start of the season, it was merely to get on the bench for a Six Nations game. “But obviously it panned out pretty differently. So you never know how it is going to go, it’s a cliché, but it about getting better every time you step on the pitch and just trying to improve. “That’s the kind of mentality I try to play with. “Everybody has areas to work on. I’m a bit of a perfectionist. Even stuff that isn’t a weakness I want to improve. “My high ball game is something that I thought was a strength of mine but there are players out there who are better. “You look at the first game (in Australia) and Israel Folau was better than me in the air. “That’s something that really annoyed me. That’s something that I’ve gone away and worked on. “There’s other stuff that you keep chipping away at every day. “The more you play the more you realise that you’re not the finished article. “I’ve learnt that at PRO14 level, I’ve learnt that at European level and now I’ve learnt that at Test level. “There’s always guys that are better at you at certain things. “But you’ve got to make sure that you’re racing against yourself and making yourself better rather than worrying about other guys,” he added. The 22-year-old admitted it had been frustrating waiting on the wings in the medical room and not on the pitch. There will also be high expectations tonight as Ulster look to put the Thomond Park massacre of a record 64-7 loss from last week behind them. “Obviously after the weekend, there were a lot of tough words spoken and stuff and the guys, on the whole, have reacted really well to that,” he said. “We had a training session (on Tuesday) and it went really, really well, guys were energized. “So the main thought processes were that we want to make a point at home this week. In terms of his input to the start of this week and dealing with the loss, Stockdale said: “For me there were a lot of guys coming in disheartened and pretty annoyed at themselves so I just wanted to bring a bit of buzz to training. “To get the guys excited to get back out there. I don’t know if I’ve done that, we’ll find out on Friday I guess,” he added. Given the hectic season Stockdale had between international and domestic duty, the young star admits the injury may have been welcome in some respects, even if the medical room can be a dark place at times. “I think to be honest, the injury in the long run probably did me a power of good, he said. “It gave me a chance to recover from a pretty long season. Helped me to get fitter, faster and stronger than I would have been able to if I had of been fit. “Obviously you would rather be out playing a match every week, but there are definitely positives you can take from it. “And I guess, after last season, a few months in the gym brings you back down to earth again - the underground will do that to you,” smiles Stockdale.